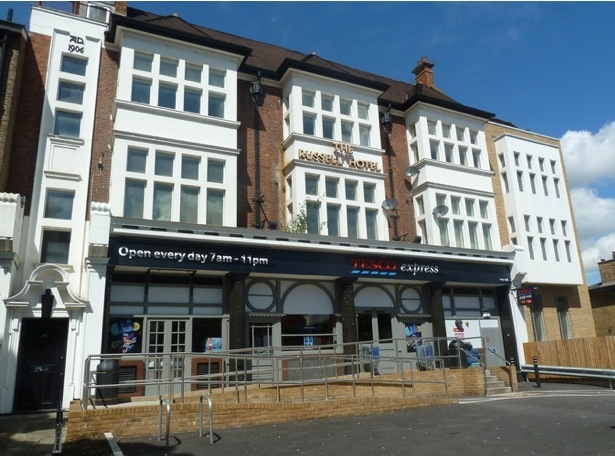 The Russell public house opened on Brixton Road in 1878 and not in 1906 which is a popular assumption. The misunderstanding regarding the age of the building comes from the fact that the distinctive frontage was added along with an extension in 1906 and that date is inscribed on the top left of the building. The building was a traditional large Victorian public house with wooden panelling, a billiards area and plenty of marble. The Russell was not originally a hotel, the rooms above housed lodgers and staff, the hotel aspect appears in the late 1920’s. During WW2 the building was hit on at least two occasions, you can read more about bomb incidents that affected the pub over on the bombing and war section of this site – here. Photo above – 1920’s. You can see that the pub sign says Mrs Lee & Son. The group of schoolchildren outside are waiting to be picked up to go on a trip. 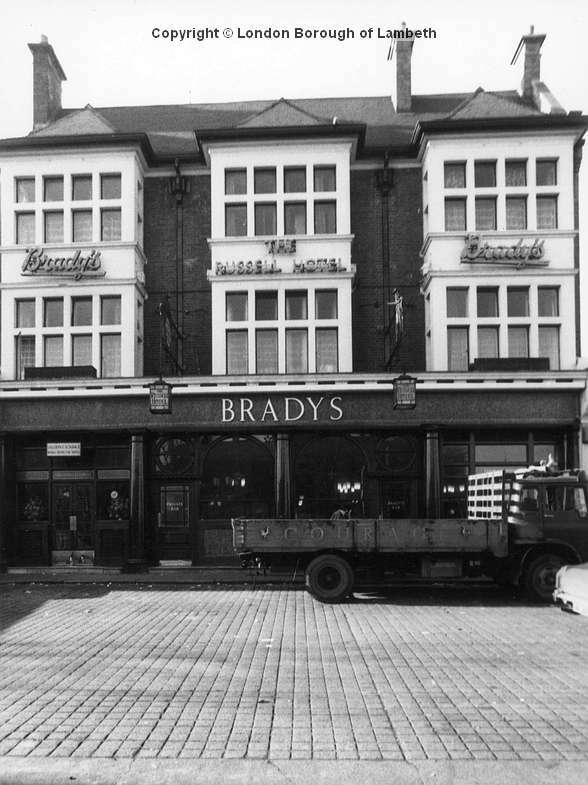 From the 1930’s until the early 1990’s the Russell Hotel was owned by the Brady family who even changed it’s name to Brady’s for a time. In the 1980’s the pub was known to be the roughest in the area and was the scene of many fights and shootings, not exactly your friendly neighbourhood boozer. After Brady’s sold up and moved to Atlantic Road the pub went through several changes of ownership and by 2003 was closed and boarded up. 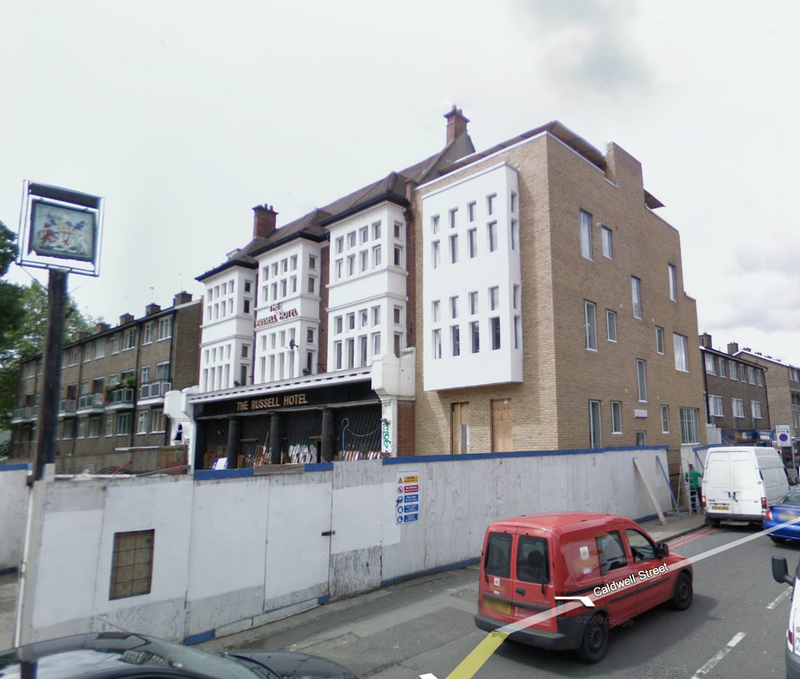 It was briefly squatted and then by late 2005 the first sign of change was that the upper hotel floors were converted into apartments and a residential extension was added onto the right side of the building, on the site of where an adjoining dairy once stood. The flats were slow to sell, this probably wasn’t helped by the fact that the ground floor remained a building site with unsightly hoardings and general mess. 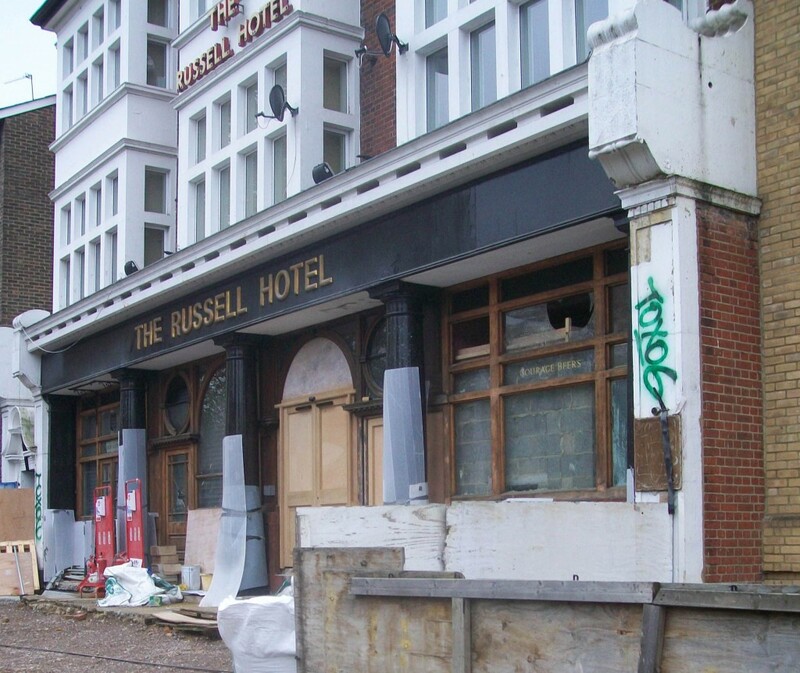 Photo above – The Russell Hotel in 2005 – note the extension to the right and the unsightly boards that remained for eight years. 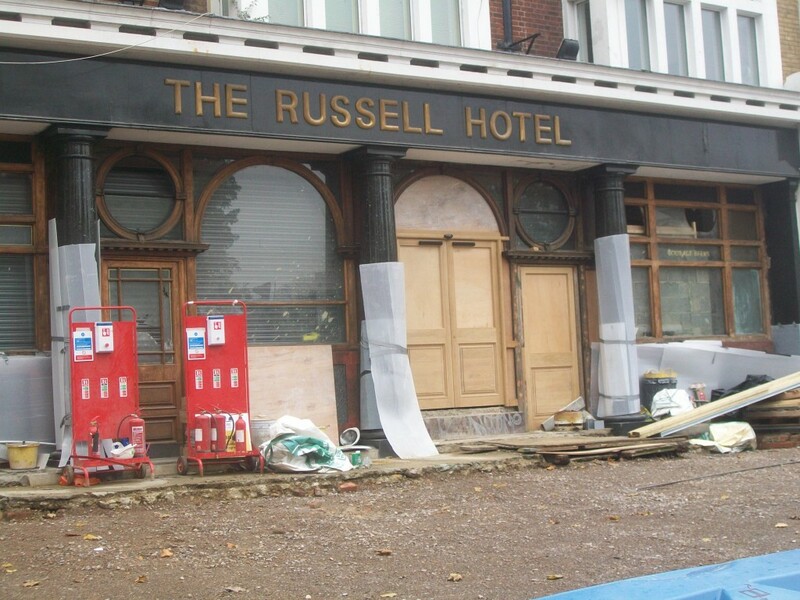 The future of The Russell Hotel looked uncertain and from 2003 to 2011 it stood empty with rumours of a total conversion into flats circulating. Then Tesco did what Tesco does and moved the builders in to create another one of it’s ‘Express’ stores, upsetting locals and gutting the interior. 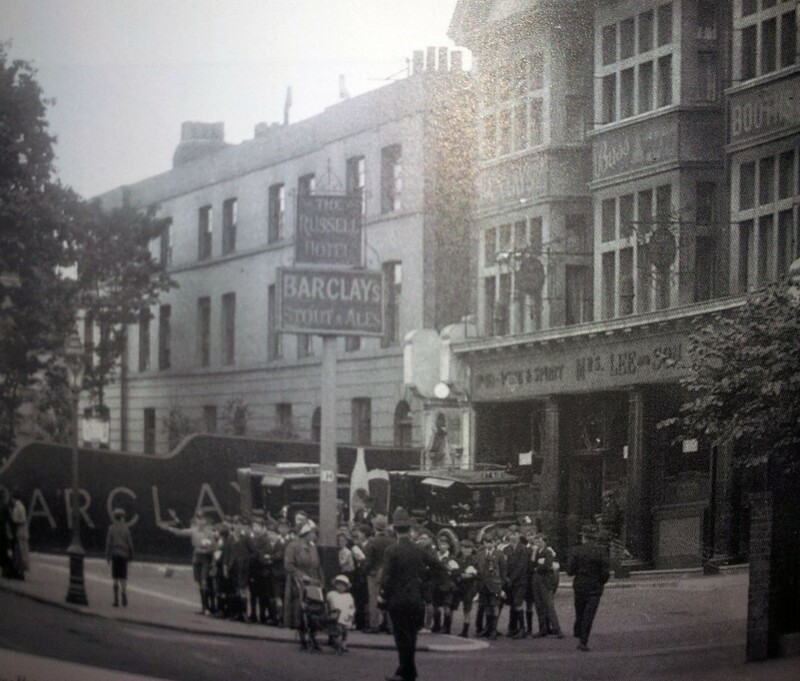 The exterior was mostly preserved, the marble pillars and the wooden window frames remain, while the Russell Hotel sign was replaced with the familiar Tesco logo and a cash machine was fitted into part of the old window. The census returns for 1881, 1901 and 1911 below list the occupants of The Russell Hotel. The Census for this part of Brixton Road in 1891 is damaged and so I’ve not been able to include that.